The Husky Air Adjustment Valve with Gauge is an in-line air adjusting valve. This 1/4 inch valve easily attaches to a 1/4 inch air hose or pipe. The in-line regulator restricts airflow to the application tool and includes a 0 - 160 psi gauge. Use for fine-tuning the airflow restriction. The Shark Bite 1/2 in. Push-Fit x 1/4 in. O.D. Compression Straight Stop Quarter Turn Valve controls water flow to household plumbing fixtures. The Straight Stop Valve is used where the water pipe enters the room to allow for easy shut-off of water flow to the end fixture allowing for maintenance and repair without having to turn water off to the entire home. The Shark Bite push-fit end allows you to simply push on to Copper, CPVC or PEX with no solder, clamps, unions or glue. Just insert the pipe and the stainless steel teeth bite down and grip tight, while a specially formulated O-ring compresses to create a perfect seal. Disassembly is just as fast using the simple disconnect tool so fittings and valves can be easily changed and reused. They can even be rotated after assembly for easier installation in tight spaces. 1/4 Inch Air Adjustment Valve with Gauge The Husky Air Adjustment Valve with Gauge is an in-line air adjusting valve. This 1/4 inch valve easily attaches to a 1/4 inch air hose or pipe. 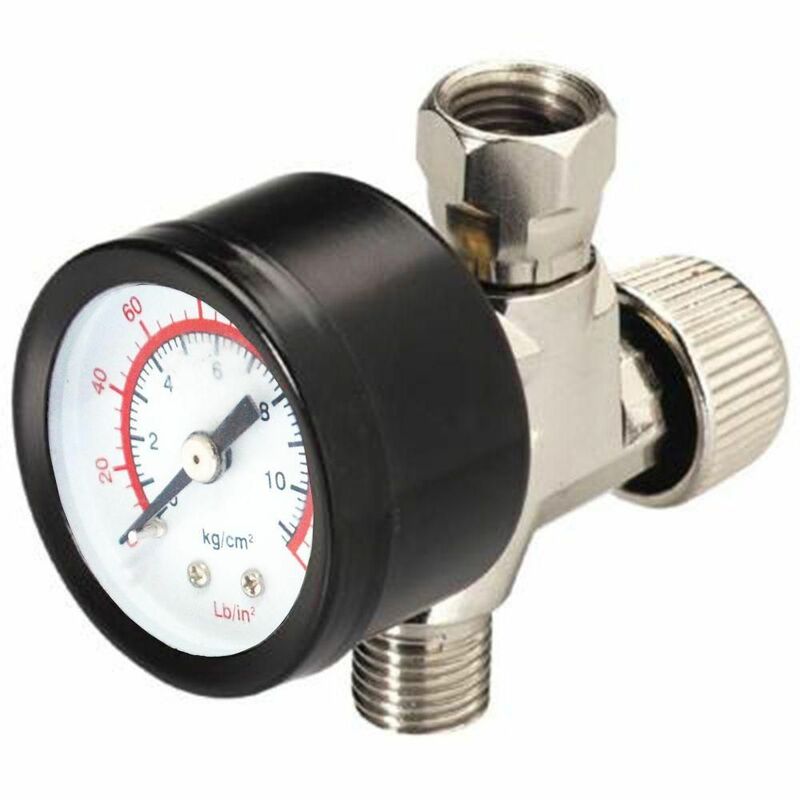 The in-line regulator restricts airflow to the application tool and includes a 0 - 160 psi gauge. Use for fine-tuning the airflow restriction.